Scienta Omicron provides high service levels. Our aim is to be a partner for customer success in research and analysis. Our knowledge and experience are vast. We offer support for more than 30 different experimental techniques, and for each one you will find a number of specialists who can support project planning, assessment of technique suitability, system design, equipment training, applications support and system upgrades. Scienta Omicron offers a wide range of standard modular solutions and continuous access to new technologies through significant investments in R&D. Along with our standard offerings; Scienta Omicron also maintains the unique flexibility, expertise and infrastructure to develop completely new concepts to meet any customer's possible special requirement. Scienta Omicron is committed to an exciting and successful future in the field of world-leading surface science. There is an ongoing effort in place to improving operations and realizing synergies. The main operations are based in Uppsala, Sweden and Taunusstein, Germany, with sales and service representation in all major markets around the globe. The Scienta Omicron LT STM and the TESLA JT STM systems are dedicated to surface science at cryogenic temperatures at 5 K or below. The Scienta Omicron VT SPM and the Fermi SPM are dedicated to surface science at temperatures between 25 K and 1500 K (VT SPM) or 10 K to 400 K (Fermi SPM). Both, the LT NANOPROBE and the UHV NANOPROBE with its four independent SPM probe stations are analytical instruments specifically designed for local and non-destructive 4-point contact measurements on all kind of nanostructures. Scienta Omicron offers a range surface analysis instruments from dedicated automated ESCA solutions to fully customized combined electron spectroscopy, SPM and MBE systems. The ARPES-Lab is the ultimate surface analysis solution for high performance ARPES studies. NanoESCSA combines electron spectroscopy with ultimate resolution; sub micron imaging XPS and µARPES with the aid of high resolution PEEM navigation, simply unique surface characterization instrument. Our hemispherical energy analysers combine excellent spectroscopy performance, ease-of-use and highest reliability designed for uncompromising XPS, AES, UPS and SAM performance. With more than 50 built instruments, the FOCUS PEEM combines powerful software and a modular instrument design. With its key strength in spectroscopic PEEM applications, it meets the trends in photoemission research. Omicron offers high performance X-ray and VUV photon sources. All sources are available as fully integrated part of dedicated ESCA solutions or as standalone components. Omicron’s range of electron sources covers a wide range of applications from dedicated products for SEM/SAM imaging to simple electron flood sources for charge neutralization. Each instrument represents the state-of-the-art for its particular application and is carefully designed to give optimum performance as part of a complete surface analysis solution. More than 20 years LEED experience enables Omicron to offer a variety of dedicated LEED and RHEED instruments along with supporting software for excellence performance and reliability. We offer the complete range of substrate preparation systems, including MBE, PLD, Sputtering and other techniques. Each thin film solution is prepared to and can be easily upgraded with more than 30 support techniques in-situ surface analysis. A wide range of extremely precisely controllable electron beam evaporators (EFM-Series) for ultra-thin (submono)layer deposition using integrated flux-feedback control. Various types of effusion cells for almost any applications are available, such as for metal layer growth, for semiconductor layer growth, for magnetic materials growth, for oxide layer growth and for organic layer growth, just to mention a few but not all. 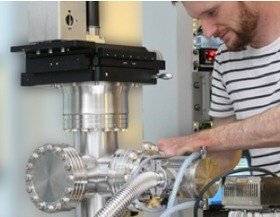 The MULTIPROBE UHV system family represents Omicron´s modular approach to cover the customers needs from compact and cost-effective solutions to tailored designs. Dedicated MBE thin film deposition and high pressure gas reaction cell system in combination with analysis (XPS, UPS, SPM, PEEM, EELS) for in-situ analysis of the catalysis process on a surface. Omicron offers products from standard cost effective systems to extraordinary high-performance XPS/ESCA or ultimate resolution SAM. The combination of the innovative MBE- and MULTIPROBE-system families enables integrated surface analysis with virtually unlimited thin film growth techniques such as ALD, PVD, CVD, MBE, sputter deposition and others. Dedicated Pulsed Laser Thin Film Deposition System in combination with Analysis (ESCA, SPM) Systems, for in-situ sample analysis of thin films grown by PLD.